Century Song by Neema Bickersteth, Kate Alton and Ross Mason, directed by Ross Mason. Photo: John Lauener. Once a year in August, the Edinburgh Festival Fringe transforms Scotland’s capital city into a vibrant, artistic landscape filled with over 4000 shows across a range of performing arts media: theatre, comedy, opera, dance, circus, and much more. The Edinburgh International Festival (EIF), a curated international arts festival, was first held in 1947. In that same year, eight uninvited companies performed their plays on the fringes of the EIF. Originally dominated by theatre, the Fringe has now far surpassed the EIF in size, and its breadth of performing arts has diversified. While stand-up comedy now draws much of the attention at the Fringe, theatre remains the second largest medium. Because most of the purpose-built theaters host EIF productions, Fringe theatre occupies converted, non-traditional, and site-specific spaces across the city. In its 450 pages, the Fringe Program lists each production alphabetically by medium (Theatre, Comedy, Dance, etc. ), and includes a short description with two genre labels provided by the performers themselves (“contemporary,” “immersive,” “new writing,” etc.). The Fringe Program is an impressive but largely unhelpful document for navigating the festival and selecting shows. Also available online and through the “Fringe 2018” app, the information is searchable digitally, but still offers no insight into quality. During the first week of the Fringe, hundreds of critics generate reviews in print and online for festival-goers. Because I also attended during the first week, I relied very little on these reviews in selecting shows. Instead, I searched the online Fringe program for keywords such as “new writing,” “devised,” site-specific,” and “immersive.” This approach yielded a week full of varied postdramatic theatre. Of the 22 performances I attended at the 2018 Edinburgh Festival Fringe, commonalities in theme, form, and use of space emerged. The prevalence of one-person shows in small spaces coincided with a multitude of women’s stories responding directly or indirectly to the #MeToo movement. Depictions of sexual harassment, sexual assault, and gender inequality illuminated a wider focus on the construction and performance of women’s stories by women. dressed., presented by This Egg/MadeMyWardrobe/UnTapped in association with Underbelly and NewDiorama Theatre, was co-created and performed by Josie Dale-Jones, Lydia Higginson, Nobahar Mahdavi, and Olivia Norris. The devised play is based on Higginson’s real-life sexual assault during an armed robbery. After the assault, Lydia shuts herself up in her parents’ attic to sew four costumes for a play that does not yet exist. Labelled as a “devised” and “contemporary” show, dressed. depicts Lydia’s healing, aided by friends and the transformative power of clothing. 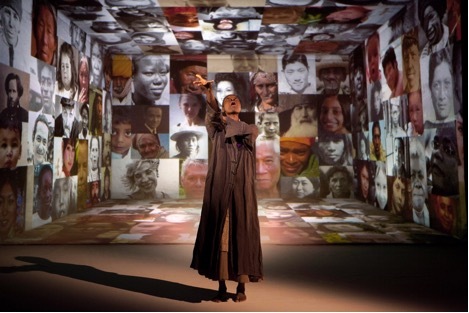 The themes in this play connect to Higginson’s separate project, titled “Made My Wardrobe,” in which she designs and constructs all of her own clothing to reassert her agency over her body. The play was performed in the Underbelly’s “Big Belly” venue, one of the many underground vaults of central Edinburgh. Upon entry into the vault, humid and dripping with condensation, the four performers energetically dance and welcome the audience. The performers play themselves and introduce each other to the audience, initiating a metatheatrical mode to examine the creation, performance, and reception of women’s stories. Configured in proscenium, the stage space exposes technical instruments and the backstage area which is occupied by costumes and props. The most prominent scenic element is a functioning sewing machine which Lydia uses to sew parts of the costumes during her monologues. While its presence serves the spectacle more than the story, the sewing machine visually supports the metatheatricality by making visible the mechanics of the performance, creating an impression of watching a rehearsal of a show under construction rather than a performance. Most crucial to dressed. is the theatrical presence of the female body, activated through movement choreographed by Norris and costumes by Higginson. Lydia dresses her friends in her costumes, transforming each actor into an archetypal performer for three separate solos. Dressed in an elegant gown, Nobahar sings a tune reminiscent of a beauty pageant talent show. Josie, wearing a tailored vest and pants, mimics a cringe-worthy standup comedy routine full of sexist jokes, calling out the audience for their laughter. In a lavish 1920s inspired flapper dress and headdress, Olivia performs a disjointed movement piece with increasingly grotesque facial expressions and body angles. Olivia’s movements, alongside Nobahar and Josie’s solos, are attempts to fulfill existing archetypes of women in performance which ultimately fail. During each solo, Lydia sits upstage at her sewing machine, attentively watching and encouraging her friends. Though these solos are tangential to the main dramatic story, they highlight the function of clothing as a tool of oppression, but also as a locus of self-expression of identity and agency. In the end, Lydia questions what “her story” is and if her identity has been reduced to her trauma. In the final direct-address monologue, she explains her show is one of the 29 #MeToo performances. She reads quotes from reviews of her show—some are full of praise for the show’s message while others are critical of its self-indulgence. Lydia wonders how an autobiographical story cannot be self-indulgent, suggesting this is a criticism more often levelled against female artists. dressed. asks the audience to consider the entire process of telling women’s stories from creation to performance to critical reception and, finally, to its tangible effects. While almost 30 plays in the 2018 Fringe articulated in their description a response to the #MeToo movement, many shows contributed to the conversation indirectly without explicitly invoking #MeToo. Fire Exit’s Coriolanus Vanishes, a co-production with Tron Theatre, is written by Scottish playwright David Leddy. Performed at the Traverse Theatre which houses two black-box venues, the production was one of ten plays in the Traverse’s program to promote new writing and Scottish theatre. While the venues are traditional in comparison to most Fringe venues, the black-box architecture proves flexible for staging innovative work in the Fringe’s most prestigious venue. Coriolanus Vanishes, written and directed by David Leddy. Photo: Sid Scott. The play begins with Chris in a jail cell. In direct address, she explains three important people in her life have recently died, including her father. Her crime and the identity of the other two people are slowly revealed as the play follows Chris through her marriage to her wife, the adoption of their son, and her affair with a man named Paul. Nich Smith’s lighting design and Danny Krass’s sound design move the non-chronological narrative flawlessly through numerous transitions in time and place. With a minimalist set design, the lighting’s vibrant colors, neon lights, and precise laser-like lines create haunting and intense images. These images illuminate Allan’s highly emotional performance of Leddy’s poetic language, delivered entirely from a desk set center stage. In this deeply psychological character study, personal moral dilemmas subtly parallel larger issues, a commonly praised trait of Leddy’s work. Chris faces her personal issues, including a history of abuse and alcoholism, while working for a company involved in the global arms trade. Reminiscent of Shakespeare’s Coriolanus, Chris’s personality and temper lead ultimately to her downfall and the destruction of those closest to her. Chris murders Paul and ultimately commits suicide in an abrupt but conclusive ending. Originally written to be performed by the playwright himself, Fire Exit’s Fringe production stars a woman, Irene Allan, as Chris. Without script changes, the gender-neutral character in this one-person show offers the opportunity to question the perception of a character’s actions. Though the play is not explicitly about gender, Leddy articulates an interest in how gender factors into audience reception of an unlikeable character. This production transgresses conventional characterization by allowing a woman character the complexity and agency usually afforded to men. Though not written by a woman, Coriolanus Vanishes contributes to the movement of complex stories about women. By placing a woman in a gender-neutral role mirroring a classic Shakespearean character, the play suggests women are as worthy of theatrical representation as their classic male counterparts. Century Song, produced by Volcano and Richard Jordan Productions in association with CanadaHub, also features a female character in its portrayal of the evolution of women’s roles in society. Starring Neema Bickersteth, accompanied by musicians Gregory Oh and Benjamin Grossman, Century Song was co-created by Bickersteth, Kate Alton, and Ross Manson of Toronto-based theatre company Volcano. Performed in the Main House at ZOO Southside and labelled as “film” and “opera,” the one-woman show uses no words. Instead, syllabic vocal parts are set to music by composers Sergei Rachmaninoff, Olivier Messiaen, John Cage, Georges Aperghis, and Reza Jacobs. The virtuosity of Bickersteth’s operatic voice and modern movement, choreographed by Kate Alton, carries an emotional depiction of women’s roles over the past century. On a large projection screen dominating the back wall and continuing onto the floor, impressive projections designed by Torge Møller and Momme Hinrichs create the visual scenery and serve as Bickersteth’s playing space. Beginning in the 19th century, Bickersteth wears a multitude of costumes which she removes gradually throughout the performance, revealing new costumes as time progresses. She first enters the stage from the audience wearing a long cloak, then reveals a plain, late-19th century servant’s dress as she stands before the projection of a room resembling a slaves’ quarters. She continually removes costumes and occasionally exits to don more layers of clothing. At one point, the live actor exits and her image reappears in the projection in a 1950s style living room. In this sequence, as time progresses, the box set of each decade recedes towards the vanishing point of the projection, revealing the next decade in the foreground. Eventually, images of the character in the 50s, 60s, 70s, 80s, and 90s exist simultaneously. Suddenly, the layers of decades are interrupted by Bickersteth reentering the stage in a modern business suit. In Century Song, the costumed body physically holds the time and place of the character as time progresses chronologically through the century. The most resonant moment of the postdramatic, filmic opera-play arrives at the end. Bickersteth moves downstage, much closer to the audience than before, to sing a piece by Canadian composer Reza Jacob, commissioned specifically for the play. In a single spotlight, the sudden proximity brings her into the present time and place in an arresting moment of closeness. Fusing opera, film, dance and theatre into a postdramatic performance, the show omits spoken text to highlight the evolution of women’s bodies in space over the last century. Similar to dressed., costume design by Charlotte Dean highlights the function of clothing as a tool of oppression as well as a device for expression in this female-centric story. Century Song, Coriolanus Vanishes, and dressed. were performed in venues belonging to larger venues often called supervenues, which manage many individual venues. While the Fringe is considered open-access, supervenues function as gatekeepers and curators, with varying selection processes, criteria, and rental fees. Many performers, however, find their production is more suited to alternative spaces. In an impressive example of site-specificity, Power Play Theatre’s series, Power Play, included four new plays focused on women’s stories: Funeral Flowers by Emma Dennis-Edwards, Somebody by Matilda Curtis, Next Time by Jess Moore, and Empty Chair by Polly Creed. Performed in a private flat on the northside of Edinburgh, the series occupied a space removed from the dense Fringe activity of central Edinburgh. Collectively, the plays depict characters diverse in race, class, and sexuality. In Funeral Flowers, Angelique shares her passion for floristry and reveals her experience in foster care as a result of her mother’s incarceration. Angelique becomes a victim of sexual assault which is captured on video and posted online, thus destabilizing her education and her life in her foster home. In Somebody, a 28-year-old woman in her mother’s home confides in the audience her reaction to her boyfriend’s recent proposal. She articulates her confrontation with societal expectations and her personal desire to be “somebody” through a regression in time from 28-years-old to 22, then 16, and finally to age 10. Next Time depicts a young woman’s attempt to escape her abusive husband. The character is unaware of the audience’s presence, unlike in the other three plays, and the script includes very little spoken text. She speaks in fragmentary whispers while seeking help on the phone as voicemails from her husband flood in. Ultimately, she is unable to escape before he returns, uttering “next time” while crawling into bed as the audience hears the flat’s front door open. The only play of the series with multiple characters, Empty Chair portrays four people in the entertainment industry sitting in a dining room. Over late-night drinks, three women and one man discover each has been sexually abused, assaulted, or harassed by the same well-known and respected man in the industry. Power Play’s Next Time by Jess Moore, directed by Polly Creed. Photo: Roberto Valdo Cortese. Viewed as a whole, the series is a remarkable undertaking in an alternative space. Each play operates distinctly in the space, varying in the flat’s relationship to each play’s story, character(s), and audience. The performers in Somebody and Funeral Flowers lead the audience of 10-15 people through different rooms. In Somebody, the flat is the young woman’s mother’s; in Funeral Flowers, the flat shifts to represent different locations. Next Time and Empty Chair both take place in a single room with stationary seating. Next Time is performed in the bedroom darkened by curtains; Empty Chair is staged entirely in the dining room. Overall, the flat represents the private spaces that hold women’s stories from youth to adulthood, oscillating between atmospheres of comfort and danger. Sometimes suffering from lack of clarity in narrative or awkward staging due to the congested space, the series overcomes its flaws by presenting diversity in women’s stories and tackling gender inequality. In their flyer, Power Play states their objective is to, “[carry] out the first ever statistical study of the Fringe’s gender breakdown, accompanied by a site-specific take-over of an Edinburgh flat to stage four brand new plays written by women and featuring predominantly female casts.” After each play, an actor explains the project and that all plays were fictional but reflected actual statistics or situations. Though I am unaware of the results of the study, Power Play intends to present their findings to the Fringe Society. Their selection of venue maximized a removed location to invite the audience to join the interrogation of the Fringe and the larger entertainment industry. Every year the Fringe offers more and more site-specific theatre. The term is employed broadly to describe a performance connecting venue literally, conceptually, or metaphorically to its story. User Not Found, created by Dante or Die and written by Chris Goode, was performed at the Jeelie Piece Café as part of the Traverse’s program, labelled as “site-specific” and “new writing.” Upon entry, the audience sits at the tables of the small café and each person is given a set of headphones and smartphone. Through the headphones, a voice is heard belonging to Terry, played by Terry O’Donovan (co-Artistic Director of Dante or Die). He emerges from his seat at a table in the corner, previously unnoticed by the audience. 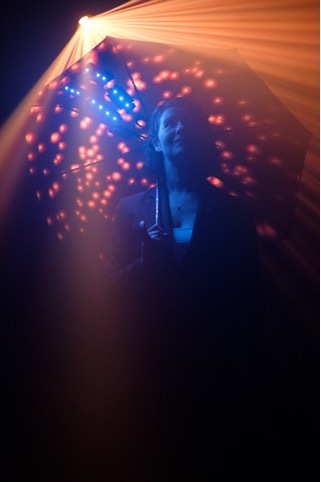 Terry initiates the conceptual connection of the venue to the play by explaining that a café is a place where people are together physically, but isolated in their own minds and virtual worlds. Through his text messages, which are displayed on the smartphones, Terry discovers his ex-boyfriend Luka has suddenly passed. Before their break-up six months prior to his death, Luka appointed Terry his “Online Legacy Executor” through a company called “Fidelis.” This company offers a platform for loved ones to sift through social media accounts and choose what should remain online after death. User Not Found by Chris Goode, directed by Daphna Attias. Photo: Sid Scott. 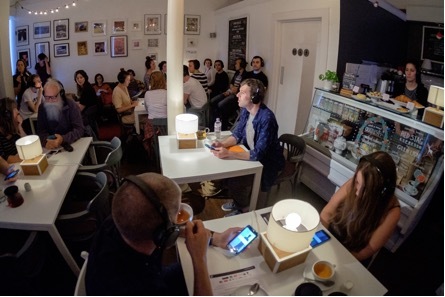 Throughout this one-man show, Terry’s voice is projected via a body microphone to the audience’s headphones with the real noise of the café and the street outside also audible. Images appear on the smartphones, including text messages, photos, and a digital clock, to provide transitions in time and place. In addition to its narrative function, the use of media in User Not Found heightens the feeling of separation in a shared space while Terry’s directly addresses and engages the audience. Moments of deeply tragic language are balanced with plenty of humor in O’Donovan’s masterful performance of a character processing grief, love, and loss in the digital age. The juxtaposition of sensory separation with close interaction between audience and actor creates for me a sense of isolated intimacy in the café. In the end, Terry asks us to remove our headphones and invites us to touch hands with each other for a brief moment of physical connection. Startling after an hour of auditory isolation, this transition into the real sensory experience of the café emotionally and theatrically punctuates the ending with tangible closeness. Dante or Die, a company known for site-specific theatre, maximizes the venue in the play’s meaning. It does not take place in the café entirely, but by beginning there, returning several times during the play, and ending there, the venue conceptually supports the play’s portrayal of human connection—both virtual and real, both living and dead. After the show, Terry leaves us to enjoy the café with each other until it closes. Nearby the Jeelie Piece Café, in an underground vault beneath the Edinburgh International Conference Center, I first attended Trainspotting Live last year at the 2017 Fringe. King’s Head and InYourFace’s 2018 production, presented by James Seabright, was performed in the same venue with a slightly different cast. The immersive theatre adaptation by Harry Gibson of the 1996 film Trainspotting, itself adapted from Irvine Welsh’s 1993 novel, capitalizes on name recognition while maximizing theatricality by staging in an alley configuration. The close proximity of the actors to the audience manifests a high-energy and darkly humorous theatrical performance of the familiar story. While the show suffers from an overly abbreviated script with rapid transitions and a rushed dramatic arc, the performers’ magnetic presence effectively transcends structural bumps in this theatrical adaptation. Filmic and literary in narrative structure, the plot resembles its predecessors through numerous short scenes placed in various locations. Shifts in time and place are cued entirely through dialogue and assisted by lighting. The minimal set design consists of a bed on one side of the alley, a couch on the other, and a toilet in the audience seating. In marketing materials for the show, the audience is warned not to sit next to the toilet. This piece of advice makes much more sense when Mark flings human waste from a public toilet into the audience during a particularly rough day struggling with withdrawal symptoms from heroin. While the underground tunnel does not correlate literally to the story, the metaphoric use of the space immerses the audience in the undersides of the iconic city, mostly known as a tourist destination. These vaults host many Fringe shows and in Trainspotting Live the space draws attention to the layers of history etched into the city’s infrastructure. Speaking with tourists on a train, the characters disparage the festivals and tourists who invade the city once a year who are often ignorant to the complexity of the city’s population and history. Evocative of Edinburgh, the actors use heavy accents, sometimes at the expense of comprehension for unfamiliar audience members. However, the authentic accents aurally place the energetic presence of the characters in Edinburgh. Despite its structural flaws, this production successfully demonstrates a metaphoric function of performance space, emphasizing atmosphere and live action over realistic representation of fictional place. Disoriented, I emerged from the congested vault to once again reflect on the visceral experience of an unfamiliar side of Edinburgh. Another site-specific performance utilizing city space, Sit With Us For A Moment and Remember is a 10-minute performance for a single audience member, produced by The Lincoln Company and directed by Michael Pinchbeck. 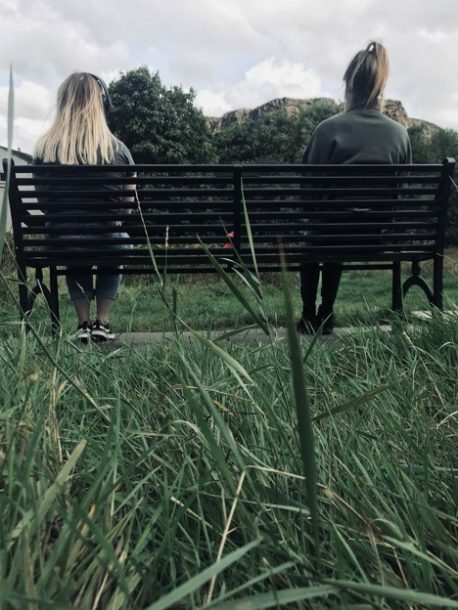 Seated on a park bench in Deaconess Garden with a striking view of Arthur’s Seat, this performance maximizes the quiet spot away from the bustle of the Fringe. Escorted by an usher from the box office on the street, I arrived at the bench and was greeted by another usher who provided me with a pair of headphones (and an umbrella in case of rain). A woman’s voice asks me to read the plaque on the bench: “Sit With us For A Moment and Remember.” “Consider the words,” she asks and if I am willing to take the moment with her to remember. She explains she can see me, though I cannot see her, and is not there yet, but will be and always has been. The text continues with a non-specificity that allows personal memories to populate the story. Then, she instructs me to close my eyes and count to ten. When I open my eyes, the actor appears and sits silent beside me and her voice continues on the headphones as we share the bench and the view. She asks me to lay my hand out and she gently places her hand on mine. Then, once again, I close my eyes and she disappears, leaving me alone on the bench with the distant noise of the city taking the place of her voice. Sit With Us for a Moment and Remember by The Lincoln Company, directed by Michael Pinchbeck. Photo: Rebecca Fallon. After a long moment, I returned the headphones to the usher who I forgot was behind me. She encouraged me to take as much time as I liked in the park—and I did. The brief, simply executed performance is deeply moving and conjured memories that transported me to past experiences in Edinburgh and beyond. The language relies on the provocation and willing participation of the audience’s personal memories. It was so powerful, a couple days later I returned for another performance, this time with a male voice and actor. Removed completely from the usual indoor spaces of the Fringe, Sit With Us For A Moment And Remember eliminates all expectation of traditional narrative and prioritizes conjuring memory through text and space in this short postdramatic performance. Postdramatic is a term that becomes very useful at the Fringe. Many performances challenge conventional representation and narrative through emphasis on theatrical elements beyond the spoken text. In addition to the prevalence of postdramatic forms, commonalities in contemporary content also emerged. The focus on the #MeToo movement at Fringe 2018 suggests theatre at the Fringe is not only embracing the postdramatic but is also prioritizing diversity and equality in storytelling. After my week at the Fringe, I discovered selecting performances based on artist-applied keywords can reveal the range in perception of common labels applied to contemporary performance. Of the many site-specific and immersive shows, the range of stories and venues exposes the flexibility, popularity, and potential for these forms to carry contemporary content. The Fringe places theatre in the non-traditional space, offering fertile ground for the new, the innovative, the experimental, and the postdramatic to thrive. The spirit of the Fringe is the possibility of discovery—a powerful motivator for trying to see as many shows as possible. Though it is impossible to see every show at the Fringe, the wealth of theatre ensures one will encounter many memorable performances and gain a sense of emerging trends in theatre from artists worldwide. Anna Jennings is the Artistic Coordinator at Arizona Theatre Company. As a dramaturg, Anna has worked on classic plays, new work, adaptation, and devised performance. Recently, she was a co-director/co-writer/co-dramaturg for Generator: The Death of Arthur, a devised play based on Arthurian Legends. Currently, Anna is writing her MFA Thesis on the fringe festival model, analyzing the Edinburgh Festival Fringe alongside other festivals, including the Tucson Fringe Festival.